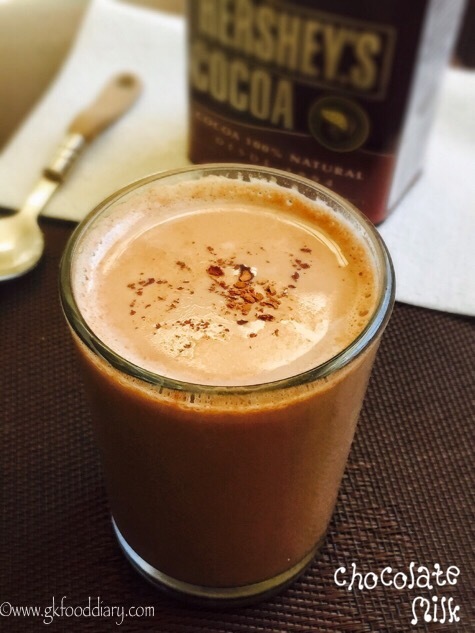 Chocolate milk is a homemade delicious hot milk made with unsweetened cocoa powder. Many toddlers and kids don’t like plain milk, hence parents always look for ways to flavor the milk. 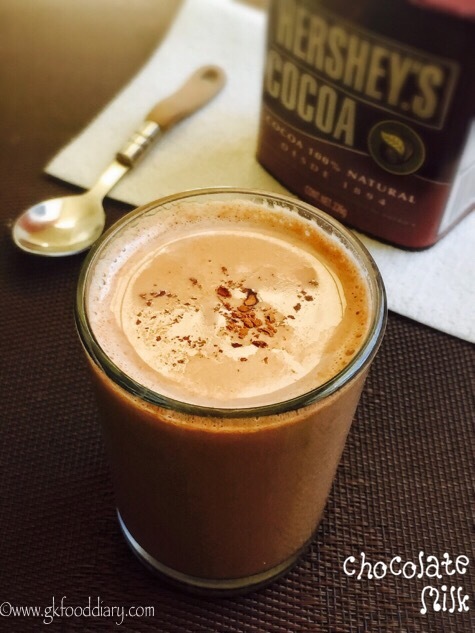 Chocolate milk is a good option for those who want to include milk in their toddlers diet. 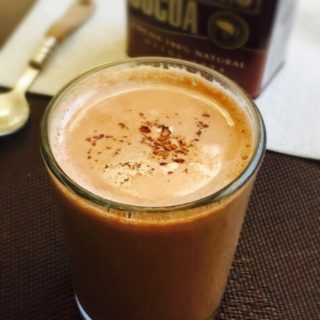 A cup of chocolate milk has goodness of anti oxidants from cocoa powder and sure a better alternative for commercially made, artificially flavored and preservative loaded chocolate milk. Check out other flavored milk recipes for kids here. This can be given to toddlers after one year. When you introduce chocolate milk to your kid for the first time, start with a small amount. 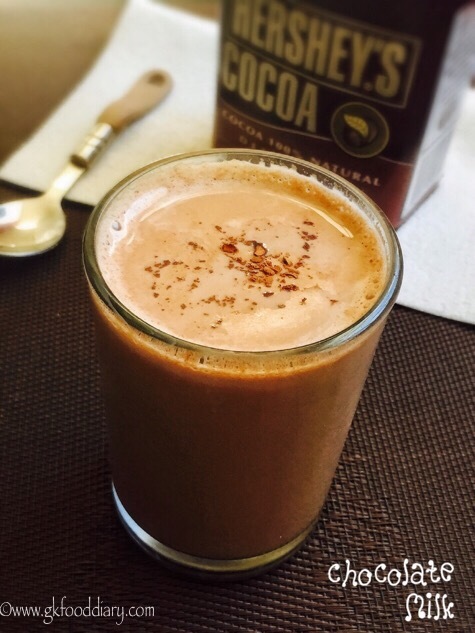 Always use good quality cocoa powder to prepare this chocolate milk. This milk is super healthy drink for kids if you skip sweetener. Hence prefer giving this milk with no or less sweetener if given regularly to your kid. You can offer this milk once in a while if adding sweetener. Lets get on to check how to make Chocolate milk recipe for toddlers and kids. Keep all ingredients ready. In a mixing bowl, take cocoa powder, palm sugar and cinnamon powder. 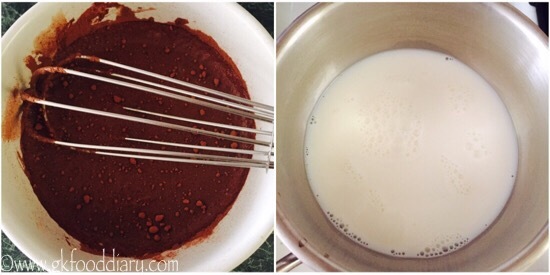 Add ¼ cup of milk to the cocoa mixture to it and mix well with a whisk. Make sure there are no lumps. Set aside. Take the remaining milk in a saucepan and add cocoa mixture to it. Mix well. 1. Keep all ingredients ready. In a mixing bowl, take cocoa powder, palm sugar and cinnamon powder. 2. 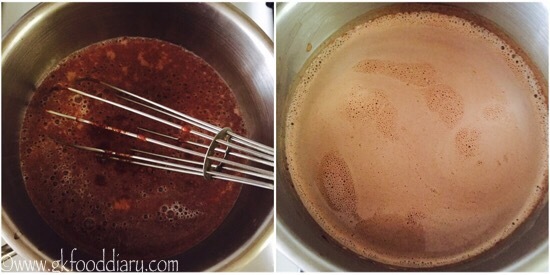 Add 1/4 cup of milk to the cocoa mixture to it and mix well with a whisk. Make sure there are no lumps. Set aside. 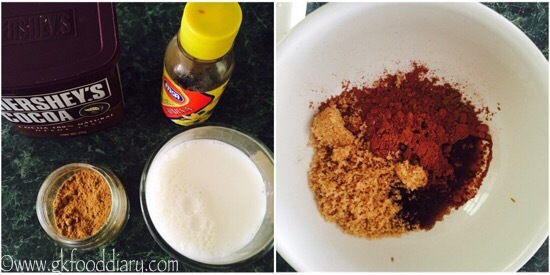 Take the remaining milk in a saucepan and add cocoa mixture to it. Mix well. 3. Heat the milk in low medium flame until frothy. Transfer to serving glasses. Serve the chocolate milk warm! 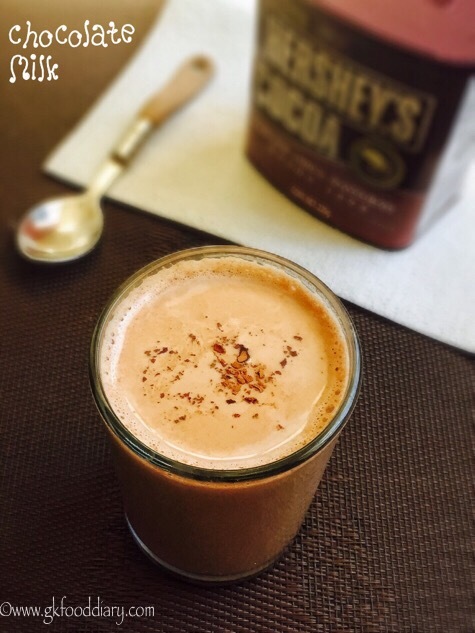 Heat the milk in low medium flame to avoid the cocoa mixture to stick in the bottom of the pan. Always use good quality cocoa powder. When you introduce this chocolate milk to your kid, start with small amount. Then increase the quantity gradually.